These two CDs continue Guild's inimitable foray into the Light Music genre which has now reached almost 30 CDs (4 more new issues will be reviewed shortly) with literally hundreds of tracks coming from scores of orchestras and interpreters. 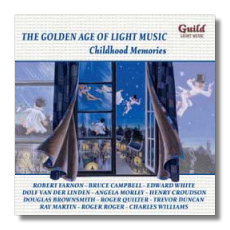 This second volume in the 'Hall of Fame' series and a new album called Childhood Memories are lovely additions to the catalogue with the latter particularly poignant in its depiction of times gone by. Amongst the various pieces one finds on the former disc is the theme from the film, 'Intermezzo' by Provost, the delightful 'Covered Wagon' by Sidney Torch and the famous 'March of the Toys' by Victor Herbert. The featured composer is Leonard Trebilco aka Trevor Duncan and there are five of his works conducted by amongst others, Frederick Curzon and Jack Leon. However by far the most compelling CD is the one dedicated to that long lost world of Children's Memories. with titles such as 'Tinkerbell', 'Peter Pan', 'Children's Hour', 'Playtime', 'Model Railway' and such like, this CD surely rises to the top of one's list of desirables. 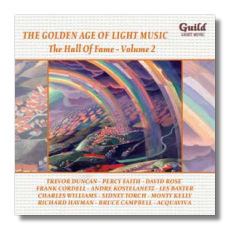 Concluding with a legendary attempt of Quilter's 'Children's Overture by the great Sidney Torch, this disc is essential material for the nostalgia prone. All the big names such as Robert Farnon, Hubert Clifford, Walter Collins and Torch are here with other less well known interpreters and orchestras. Yet again, one cannot but offer a sincere thumbs up to such wonderful collections, deigned to grace and shelf in a trip back into time.